They say that everyone is Irish on St. Patrick's Day. 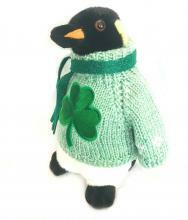 Perhaps the most extreme example of this comes in the form of this adorable St. Patrick's Day Emperor Penguin. Why settle for a boring pet trim when the Igogo Pet Salon will nick-nack, paddy-wack, give your dog a bone trim! Whatcha doin'? Can I help? Is it food? I'll be happy to eat it for you! Cow Livin' The Good Life With Bisons? How could it be that a young female Polish cow would rather hang with some beefy bison versus her own species? I'm feeling so cooped up! If only I had thumbs I could get myself out of this chicken outfit. If it fits, I sits. If it doesn't fit I give it some hits until it fits -- and then I sits. Trying to potty train your toddler is quite a chore and trying to do it in public restrooms is even harder. With this adorable Owl Potty Training Seat you'll be all set at home and on the go! You Can Collect These Disney Toys, But They're Really Meant For Your Dog! Monkey Sees, Monkey Does! Monkeys Becoming More Human?